Do you know what a wine fault is? I thought I did, until the London International Wine Fair when APCOR, the Portuguese acronym for Associação Portuguesa de Cortiça (Portuguese Cork Association), sponsored a tasting on wine faults. They’re goal was to help guide wine professionals and social media influencers through an educational session that described the various faults that can effect a wine’s aroma and taste other than cork taint. As for the vast array of other wine faults, I’ve generally found that words such as reduction, oxidation, brettanomyces are never added to a consumer’s wine vocabulary, and quite often, equally overlooked by wine professionals – reduction being the most misunderstood by far. The consumer sees wine as a static object, rather than produce, which is perishable. They assume that upon purchase, the wine will remain in a bubble of alcohol, protecting it from the bad, and enhancing the good. What they fail to see is that a wine is a living breathing product, and like a bag of grapes, it can rot or mature over time. As for the professional, without proper training, they may incorrectly categorize a wine. Hence, it is of no surprise that this particular session at the LIWF was not only the one that I was most eager to experience, but that I felt the most confused and passionate about afterwards. Having tasted 8 wines of the exact same producer, vintage and style, 7 of which were faulted, I walked away feeling more ignorant than ever before. Sure, I can generally pick out a corked bottle of wine, signaled by its ubiquitous wet cardboard aroma, but the 7 faulted wines I tasted with APCOR were not easy to discern as faulted. Many of the “off” aromas were subtle and elusive. When placed alongside the control wine, I could easily pick out the faulted versus the non-faulted, but without the control, I often remained in the dark. Over the course of the day, I tasted every faulted bottle several times over, but my conclusions were indecisive. I did, however, walk away with some rather pressing questions as a result of APCOR’s seminar. Your faulted wine is my delicious libation! 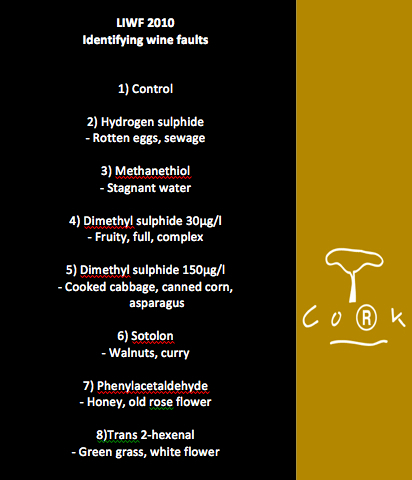 Agreeing on what is, and what is not, a wine fault can be rather tricky. Just between Ryan and I, taste can vary dramatically. We’ve tasted wines that have provoked two very different, and quite emotional, responses. While he felt it was liquid gold, I wanted to pour it down the drain. Equally true, taste can vary according to to one’s nationality. While one culture may be more tolerant to bitterness, another may be more tolerant to tannins. To a winemaker, it’s any wine that departs from its “norm”. So where does that leave us? In the tasting with APCOR, some of the wines “should have” been perceived as faulted, but I found them perfectly drinkable. If compared next to the control wine, I might have agreed and seen the fault, but without the control wine, a few I’d continue drinking throughout the evening. So is this is an issue of personal taste, a high threshold to a particular fault, or maybe, a cultural norm? How many consumers are aware enough of a grape’s characteristics to discern if the wine is flawed or just not a style they’re keen on? Example, cat piss is a common descriptor of Sauvignon Blanc – not necessarily everyone’s cup of tea (erm..wine) and could easily be described as “off” if one didn’t know better. 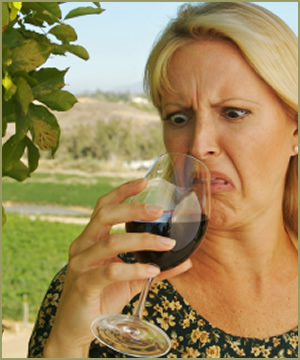 If you know that wine typically smells of “x” then you can discern when the wine smells different or off. For a consumer, this can be very confusing. If I take it to the professional level, how are you supposed to know if the wine shows tipicity or not if you’re unaware of the grape or region? As an example, Ryan and I tasted a Sherry wine from California last week. If it was placed in an international blind tasting among other Sherry styled wines, we might have considered it “off” because while it was an interesting Flor influenced wine, it did not seem to fit in theÂ true definition of a sherry. My questions are endless, but I’d rather know your thoughts! Have you experienced a successful educational platform on wine faults? Should we better educate consumers, and if so, how? APCOR educational session on detecting wine faults from Ryan and Gabriella Opaz on Vimeo.